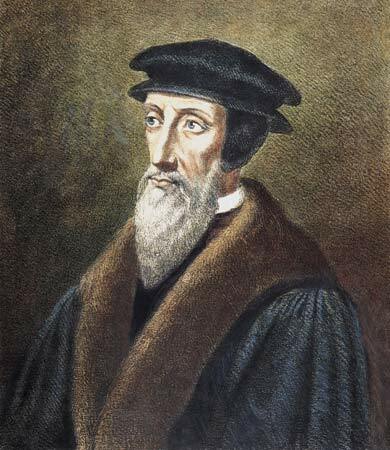 John Calvin was born on July 10th, 1509 in a humble family. He began by studying for the priesthood, but his father later transferred him to the study of law. When he was at the University of Orleans God saved him when he was about 23 years old through the study of the scriptures. When he was saved he would study the Bible at night after studying law during the day. In 1533 he returned to Paris, and continued teaching those around him. The same year he was forced to flee because of a bold sermon he wrote for his friend Nicholas Cop, a Protestant who was rector of the university. He moved on to Switzerland, where he published the first edition of his great work, Institutes of the Christian Religion in March, 1535. In it he gave a systematic theology of the Christian religion. He continued to revise it throughout his life. He then went to Italy, and after a time was captured by the Catholics. He was rescued by some friendly soldiers, and then he traveled north again. On his was he stopped by Geneva for the night. Geneva had been recently reformed through the work of William Feral and others. Feral asked him to stay in Geneva instead of going on to Strasbourg to study. He said, “Ought the servants of Jesus Christ to be so delicate as to be frightened at warfare? … May God curse your repose ! may God curse your studies, if in such a great necessity as ours you withdraw and refuse to give us help and support!”1 Calvin agreed, and he became a pastor at Geneva. He helped continue to work for the reform in Geneva. At that time he also helped defend true doctrine in other churches. He was an able debater against heretics. In 1538 he was banished from Geneva for three years by the enemies of the reformation, but after that time he returned. While he was banished he married Idelette de Bure. When he returned to Geneva he continued to teach and preach. He had a great effect on other reformers from other nations, and Geneva sent out hundreds of missionaries to places as far as Brazil.2 He was the most able defender of the Reformed faith from all its enemies. He died in 1564. He was one of the most prominent reformers, and he has had a great effect on many people through his writings, even to this day.